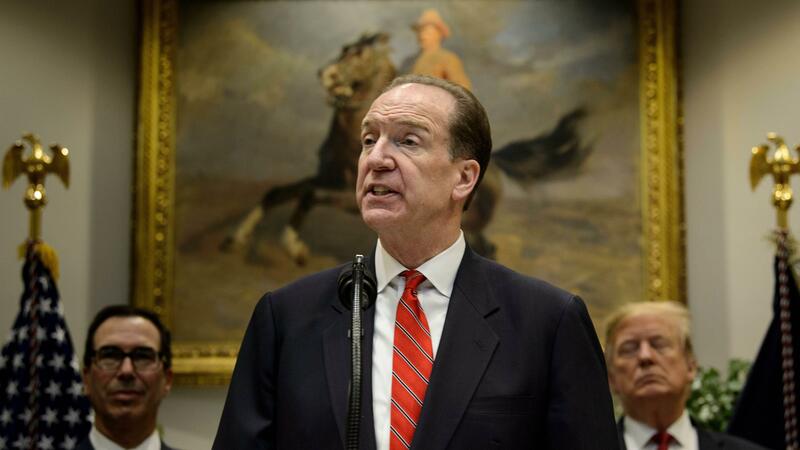 WASHINGTON, April 5 (Xinhua) -- David Malpass, undersecretary for international affairs at the U.S. Treasury Department, was selected as president of the World Bank Group for a five-year term beginning on April 9, 2019, the World Bank Group said in a statement Friday. Malpass, 63, was chosen by U.S. President Donald Trump in early February as the U.S. candidate for the post, and has secured approval from the World Bank's board after a campaign without competition. The Board expressed its deep gratitude to Interim President Kristalina Georgieva for her dedication and leadership in recent months, the World Bank Group said in the statement. Former World Bank chief, Jim Yong Kim, abruptly announced his resignation in early January. This long-held tradition has put the credibility of the organization into question, given that emerging markets' and developing economies' total contributions to global economic growth have far outweighed those of the advanced economies in recent years. In February, Malpass thanked the U.S. president for selecting him to lead "the world's premier development institution." Highlighting the 13-billion-U.S. dollar capital increase and other reforms that the World Bank shareholders endorsed in April 2018, Malpass said, "With shareholders and dedicated staff, there is a great opportunity now to implement these constructive reforms that will lead to faster growth and greater prosperity."